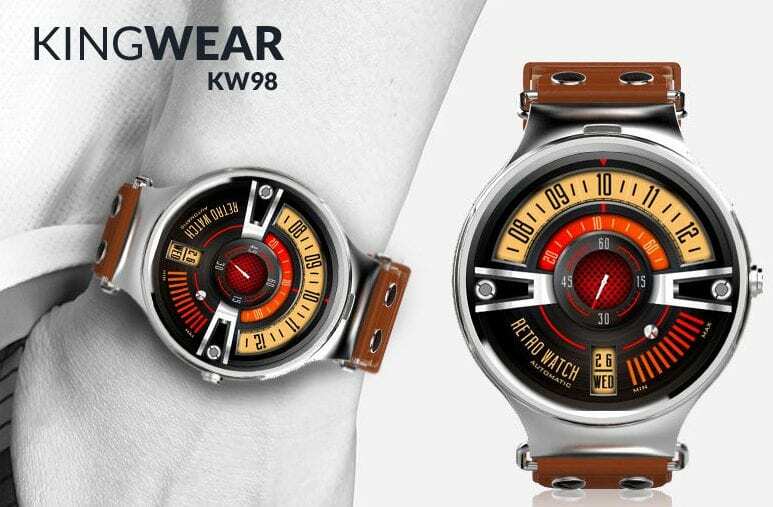 The three-year-old China-based smart wearable production company responsible for the design and production of the KingWear GV68 and KingWear KW88 is back again with yet another nice smartwatch; KingWear KW98. Without wasting much time, let us jump straight down to reviewing this smartwatch. The KingWear KW98 possesses a fabulous body design that qualifies it as a smartwatch for work, social functions, play, and sport. The device as seen from the image above boasts of a super sleek, compact and shiny stainless steel body structure attached to a leather strap which is available in variety of colours. You can get the Black, Brown, Blue, Red, Mint Green among many other available strap colour. The main stainless steel body which is the powerhouse of the KW98 smartwatch together with the strap/band attached have dimensions 26.20 x 4.70 x 1.90 cm or 10.31 x 1.85 x 0.75 inches and offers quite a lot at its 0.0570 kg weight. The KingWear KW98 displays the smartwatch output through the 1.39-inch AMOLED screen. Approximately the same screen size and quality as the ZTE Quartz and Zeblaze THOR 3G Smartwatch. The KW98 smartwatch comes with a 400×400 pixel display resolution. Heading back to the screen size, it is just the perfect screen for the fingers to control and operate on. The Apple Watch Series 2 has a larger screen size though. The KingWear KW98 smartwatch is powered by a MediaTek MTK6580 processor. The pretty fast processor is supported by an Android 5.1 Lollipop operating system. With this processor and OS, the KingWear KW98 smartwatch provides smooth processing of apps and other functions of the smartwatch. Speaking on storage, the KW98 smartwatch has a quite large internally built 8 GB ROM and 512 MB of RAM. Right under the back cover, there is space for one SIM card and this enables the smartwatch with the ability to make and receive phone calls. The powerful KingWear KW98 smartwatch is kept alive by a 400mAh battery. According to the manufacturer, KingWear, the KW98 smartwatch can power the smartwatch for a minimum of 2 days when in standby mode. The battery capacity of the KingWear KW98 places it way above other top smartwatches. Just at the back of the smartwatch, there is an accurate heart rate monitor/sensor carefully and neatly embedded. The sensor reads and records the wearer’s heartbeat and subsequently upload the results wirelessly to the connected smartphone which translates the result. The Kingwear KW98 has numerous watch faces or dial to choose from. The KW98 also possesses a pedometer that helps count the number of steps the smartwatch wearer takes at stipulated periods. The KingWear KW98 smartwatch costs between $119 – $130.